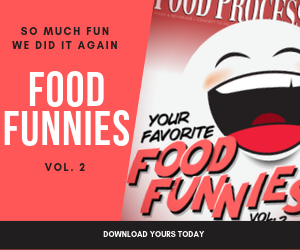 May edition of Food Processing's Food Funnies, a monthly feature guaranteed to give you a good laugh. Congratulations to Vanda Grbic for the winning April Caption! So….I see you've taken the position for taste tester! Well well well - just like the good ole days when chocolate wasn't considered a food. LET'S GET TO EATEN! The food here is so bad, I didn't think we even needed that sign. I guess I was wrong! Dave, for the last time, stop blaming QA! Since the sign clearly isn't working… I think we'll just have to demote you to the raw chicken line. What do you mean, You just got back from calming the boss down? And NO Peterson, - the excuse that you can’t read, doesn’t work anymore. These medical grade brownies are selling like hot cakes. You wouldn't be fudging, would you?